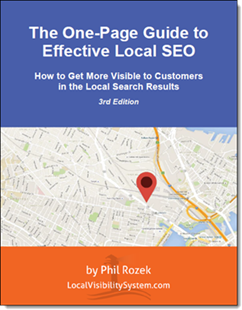 Recently I learned of a new tool that helps business owners ask customers for reviews. It’s called Grade.us. From what I’ve seen so far, I like it. You create a page (hosted on Grade.us) that contains two things: (1) a message to your customers, and (2) some buttons that they can click on to write you a review on any of a variety of sites. 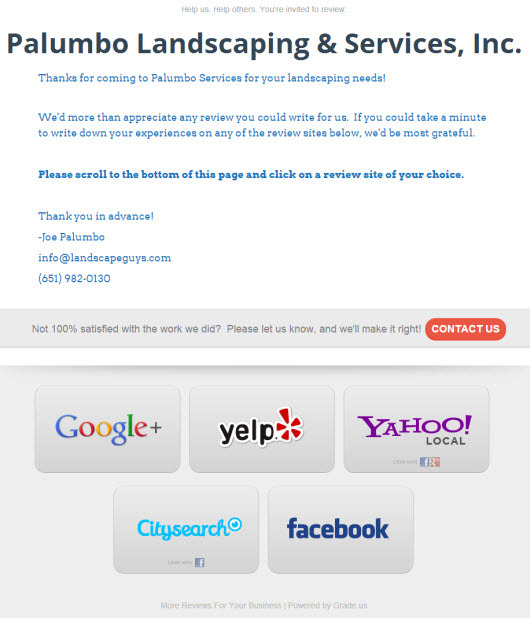 Then you just send your customers to that page, from which they can choose where they’d like to review your services. As you can tell, each button links to your business listing on a given site. Obviously, that means your business needs to have a live listing on a site, so that you can visit your listing and grab the link and paste it into Grade.us. Google+, Yahoo, Yelp, Angie’s List, CitySearch, InsiderPages, MerchantCircle, YP, SuperPages, YellowBook, Facebook, Twitter, Foursquare, LinkedIn, Patch, YellowBot, Tupalo, DealerRater, Cars.com, OpenTable, UrbanSpoon, Zagat, MenuPages, Vitals, HealthGrades, RateMDs, UCompare HealthCare, DROogle, Wellness, ThirdAge, SpaFinder, Zillow, Trulia, TripAdvisor, Fodor’s, Orbitz, and Travelocity. You can also add a “custom link” – that is, create a review button for a site that’s not on the long list. It has a clean, simple layout for customers. Also, the buttons are nice and big. When customers click on the buttons, they’re given a few quick site-specific instructions for how to write a review on a given site (if they don’t know how already). The variety – the fact that it has review buttons for 37 different sites, and lets you create a custom link (in case there’s a different site you want reviews on). As I explained during my talk at SMX West, giving customers choices and not shoehorning them into one review site or another is the best way to avoid having your reviews get filtered. The buttons show customers which sites allow them to log in with their Facebook (or Google) usernames. It doesn’t attempt to censor people who might write you a less-than glowing review. Some review-request tools will first ask customers to indicate how many stars they’d like to leave you, and if it’s fewer than a certain number of stars, they’ll be shuttled off to a “Contact Us” form. This is bad in several ways, but the worst part is it makes the process unnecessarily complicated for the customers who will write you a very positive review. The user-interface for you is nice and simple. You don’t even need to know any HTML. It’s quick to create your page. I created one in 10 minutes. It’s affordable, at $29/month for a single location or $59/month for multiple locations. It’s nicely white-labeled – as much as can be, short of having your page hosted on your site. The Grade.us logo isn’t plastered on your page, and you can choose not to include the already-unobtrusive footer link on your page. You can integrate your page with Google Analytics. There are some elements that you should be able to customize, but can’t at the moment. For instance, some might say the review buttons are too big, and that for a certain customer base (e.g. younger customers) smaller buttons would be better. They need an FAQ page, and maybe a “Dos and Don’ts” resource. It’s still a new tool – which means there are still a few bugs. For instance, the “Forgot password?” option doesn’t work, if you happen to forget your password. Grade.us is nicely put together. It’s quick and simple to set up your page, and it makes it simple for customers to post reviews. From what I can see, it’s also ethical: You’re not dissuading less-than-beaming customers from posting a review. It’s so new I haven’t had much of a chance to field-test it for my clients, but it’s already a very good tool, and I’m looking forward to seeing it progress further. Any feedback on the tool? Questions for me or for the Grade.us crew? Leave a comment! I’m sitting here doing this the hard way, can’t wait to try it out. You got it, Chris. Thanks for stopping by! Phil, this is really cool, at first I thought $29/month was a tad high, but looking at your example, I can see the value. Thanks for weighing in, Matt. Yeah, $29/month isn’t bad at all. Thanks, Matt. We tried to balance a few things in our pricing: making it affordable for small businesses, making it profitable for resellers (on our $59/month marketer plan), undercutting all other “review-generation” products, and charging enough to allow us to continue to invest in and add value to the product. So far, so good, but we take in every bit of feedback. Thanks! Looks like a really useful tool, thanks for reviewing it Phil. Hey Jon – is there any plan to have an option that will allow users to host the service/page on their own websites? Great call on the DIY hosting. Every time you stop by here you throw out a great “head-smacker” idea! What you’re suggesting, though, may be more like a widget that let’s you embed your Grade.us review funnel anywhere — this is definitely on the product roadmap. I’ll be sure to give it a +1! If I have misunderstood what you’re suggesting, though, please let me know. Thanks Jon – yeah, I was thinking of “widget” that could be embedded anywhere, but the white-label service is definitely nice too. What would be super cool is some sort of iframe that we could put right on the clients site… I guess that’s similar to what you are talking about. There’s nothing to *stop* you from iframing in a Grade.us page on a client site, but we don’t provide any snippet today to handle this automagically. The tricky bits would be: getting the iframe the right size to accommodate the content; pulling in just the content you want; and getting it to look naturally integrated with the destination site. I think the idea behind a widget from us would be to bring the same functionality we provide on Grade.us pages to any site with a simple embed and the ability to style the widget enough so that it looks native. We’ll get there! You guys had suggested that we make the Grade.us “review funnel” more versatile, like with an embeddable widget or iframe. It’s been a few weeks, but we’ve now had a chance to build this feature out a little. The idea was to give you control over where and how you drive customers through posting a review — for example, you mentioned keeping them on your clients’ site rather than driving them to a separate landing page on Grade.us. Now you can do that. You can check out examples here: https://about.grade.us/widgets . If you have a minute to look, I’d love to get your feedback here or via email to jon at grade dot us. Thanks so much! That looks great, Jon. I tip my hat to you for listening to feedback so closely. Thanks for the update! I agree, thanks for listening to the feedback. How do I get the widget? I’d like to present it to my clients and see if I can get them to put it up. By all means, let me know how it goes or if I can help. Works great. I put it up on my site to test and I like the functionality. Thanks for the heads up, Phil. Also it’s built on a responvie design so even more kuddos to the grade.us team for thinking ahead. Have you used this for any clients yet? Any feedback from them? I believe a couple of my “X-Ray” clients have started using it, but I haven’t gotten any feedback yet. Very interesting tool. I have seen a few that are similar with white label and I know some local marketers charging $97+ per month. This is much cheaper and seems much easier to set up. I think the idea has a lot of potential for small businesses. I look forward to seeing it evolve. Unfortunately, it is not available yet in French. As soon as it is, I will definitely recommend the product to my clients in Québec. Until, I will certainly mention it, as both Google Places, as well as Trip Advisor and Yelp are available here of course. It will definitely be nice once Grade.us is in other languages. Agreed. We did imagine ours being a universal tool, and so we built it with the ability to render in different languages, but we haven’t actually done the translation work yet to support any language other than English. I can see that limitation being frustrating to marketers who serve non-English-speaking communities, so it may be time for us to revisit the idea of broader language support. Thanks, Micheline! Good luck and continued success to Grade.us as you move forward…. I signed up for Grade.us a few weeks ago. While I haven’t had the opportunity to dive into it much for my clients yet, I really like how it works so far for my own review site. 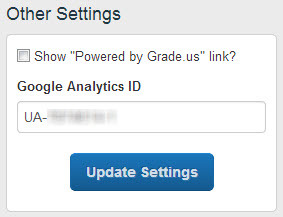 The support from grade.us is great and everything is very straightforward, and customizable. I love the clean interface as well. Thanks for sharing that, Tyson – great to hear. Grade.us is nicely thought-out, all right. Very easy to use. Easy to white label. Affordable on the reseller level. Classy. Works. I will be rolling it out to two clients over the next few weeks. I was using a product that filters negative reviews (stops from posting, redirects to email customer) but it’s too cumbersome for a user to use to write reviews. This works excellently from the point of view of the person writing the review, therefore more reviews will get posted. To respond to your questions: Yes and yes. We provide white-labelers marketing assets in the form of an evolving, unbranded Powerpoint deck that contains the selling points, research and images/illustrations you need to sell the product to your clients. You can use the deck itself or drag/drop useful parts of it into banner ads, direct mail pieces, whatever. Much of this material is culled from my book, so give a look at that to gauge quality. We also recently rolled out branded lead-generation pages for our white-labelers. Here is an example of a white-labeler’s lead-gen page: http://reviewmychiro.com/ Their “review funnel” pages have a “powered by ReviewMyChiro” link that links back to the lead-gen page. While we don’t white-label our entire portal, you can operate the entire service under your own brand/domain with no trace of us, from customer acquisition through delivery of the service. That’s awesome, Martyn! If you come across anything we’re missing or could do better, don’t hesitate to reach out. For your attorney client, you may want to include sites like Avvo and LawyerRatings.com, which will be available to you as a marketer. For you and anyone else reading this, you can use the promo code “tryus2013” to get the Marketer plan free through the end of 2013–admittedly, that’s just a couple weeks, but since you appear to be in sales mode, it could be useful! The solution is not to ask people who aren’t active Yelpers to write a review on Yelp. The reviewer’s level of activity – “trust,” if you like – is the main factor (by far) that determines whether a Yelp review sees the light of day. But does the fact they are using a office tablet with the same IP address cause moderation as well? Yelp I mean. Second, Phil is right, of course–these days, only active Yelpers see their reviews published. I haven’t looked at your campaigns, but by default Grade.us attempts to steer non-Yelpers to any other review site to avoid squandering the review. Third, Yelp is one of the major review sites (along with Google and TripAdvisor) to explicitly prohibit you from having customers/patients write reviews while still at the place of business. Therefore users sharing a device ID and IP address may be aggressively filtered, even if they use their own Yelp account.